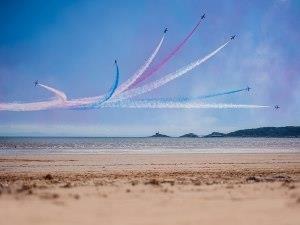 Breathtaking aerobatic displays over Swansea Bay, state-of-the-art aircraft and vintage planes from the past, will again be thrilling hundreds of thousands of visitors in the skies above Swansea. It’s not just breathtaking aerial acrobatics on offer at the Wales Airshow – there’s plenty of family fun to be had on the ground too! With flight simulators, fun fairs, armed forces vehicles & displays and much more, there’s loads to see and do. And don’t forget plenty of food and drink on offer as well! The ground displays are open from 10am – 6pm both days, you can arrive early to beat the traffic and take in the displays before the action in the air kicks off.